If you are adapting an existing open textbook, the adaptations you make will be released with whatever open license you choose, while the rest of the book will be released under the license of the original book. In other words, you need to respect the license of the original work. You cannot license what you do not create. You can only attach a CC-BY (Creative Commons Attribution), or other open license to the parts of the book that you have created and are new. However, there is a caveat. If the textbook you are adapting has a Share-Alike condition (e.g., CC-BY-SA 4.0) stipulated, then you must release the entire book using the same license as the original book. For more information on Creative Commons licenses, see Choose a License. The Creative Commons license definitions listed at the bottom of this page have been copied from Creative Commons and are used under a CC BY 4.0 license. Choose a License by Lauri M. Aesoph is licensed under a Creative Commons Attribution 4.0 International License, except where otherwise noted. If you are adapting an existing open textbook, the adaptations you make will be released with whatever open license you choose, while the rest of the book will be released under the license of the original book. In other words, you need to respect the license of the original work. You cannot license what you do not create. You can only attach a <a target="_blank" href="https://creativecommons.org/licenses/">CC-BY (Creative Commons Attribution)</a>, or other open license to the parts of the book that you have created and are new. If you are adapting an existing open textbook, the adaptations you make will be released with whatever open license you choose, while the rest of the book will be released under the license of the original book. In other words, you need to respect the license of the original work. You cannot license what you do not create. You can only attach a <a target="_blank" href="https://creativecommons.org/licenses/">CC-BY (Creative Commons Attribution)</a>, or other open license to the parts of the book that you have created and are new. However, there is a caveat. If the textbook you are adapting has a <strong>Share-Alike</strong> condition (e.g., <a target="_blank" href="https://creativecommons.org/licenses/by-sa/4.0/">CC-BY-SA 4.0</a>) stipulated, then you must release the entire book using the same license as the original book. However, there is a caveat. If the textbook you are adapting has a <strong>Share-Alike</strong> condition (e.g., <a target="_blank" href="https://creativecommons.org/licenses/by-sa/4.0/">CC-BY-SA 4.0</a>) stipulated, then you must release the entire book using the same license as the original book. The Creative Commons license definitions listed at the bottom of this page have been copied from <a href="https://creativecommons.org/licenses/">Creative Commons</a> and are used under a <a href="https://creativecommons.org/licenses/by/4.0/">CC BY 4.0 license</a>. 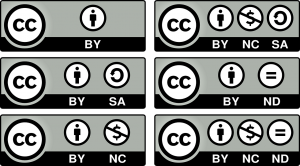 The Creative Commons license definitions listed at the bottom of this page have been copied from <a href="https://creativecommons.org/licenses/">Creative Commons</a> and are used under a <a href="https://creativecommons.org/licenses/by/4.0/">CC BY 4.0 license</a>.